Remember the “two tables” of the Liturgy as expressed by Vatican II? The Eucharist and the Word. They are both important and form a unity. Christ Himself, though one person, has two natures: divine and human. Why is it that there often seems to be such a radical dichotomy in the Church, similar to that of the separation between West and East, so that “conservative” (or “right-wing”) believers prefer adoration while “liberal” (or “leftist”) believers prefer service of the poor, to the exclusion of the other? The enemy of souls must really love this (One can think of other such apparent contradictions like traditional prayer in Latin versus charismatic prayer - both of which, by the way, are approved by the Church.). To be Catholic means to be open to ALL that is good and serves to build up Christ’s Kingdom, while remaining radically faithful to the sacred deposit of faith and the teaching of the Magisterium (“Catholic” means universal!). 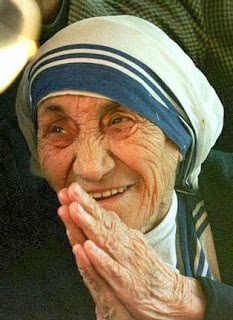 Why not unite both hands in prayer and service like Mother Teresa did? People are often shocked when they discover many such “paradoxes” in a person or a community. Pope Francis is clearly showing us, by a most splendid example, that to be truly Catholic we need to be BOTH devoted to God and our neighbors in authentic Christian love. I would even go so far as to say that he is showing us BOTH/AND – the “AND” being that we also need to grow personally in our own continual conversion in order to be pure vessels of Christ’s love to others as His priests, prophets, and kings. Let us each examine our own conscience. Where am I strong and where am I lacking? Am I praying often and well enough? Going out of my comfort zone to serve the needy? Too full of myself? Too busy about my own cares and concerns and not those of God and others? Let us all strive, like Mother Teresa and Pope Francis, to be humble, prayerful, and loving. Then we too will have “holy hands,” becoming a blessing and not a burden to all we meet (We could also add holy eyes, ears, tongue, feet, etc.!). Let us be totally consecrated to God. Amen – so be it!